A biological approach to tooth repair uses a collagen sponge to deliver small-molecule drugs that stimulate stem cells in tooth pulp to generate dentine. Teeth have a natural repair mechanism, but it cannot cope if teeth are overly compromised, for example, by large cavities or trauma. 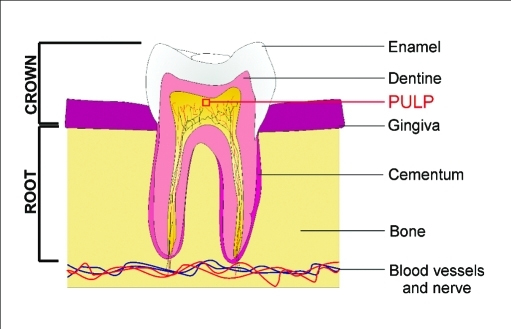 But this mechanism, which relies on the generation of dentine by stem cells, can be given more bite. How? According to a team of scientists at King’s College London, a collagen sponge suffused with the right kind of drug can do the trick, and might even obviate the use of inorganic cements to effect tooth repair. The new method was presented January 9 in the journal Scientific Reports, in an article entitled, “Promotion of Natural Tooth Repair by Small Molecule GSK-3 Antagonists.” GSK-3 refers to glycogen synthase kinase-3, which is part of a cell signaling cascade involved in natural tooth repair. The current study evaluated three GSK-3 antagonists, one of which is a small-molecule drug called tideglusib, which has previously been used in clinical trials to treat neurological disorders, including Alzheimer's disease. Tideglusib, the authors noted, is particularly interesting because it has already passed crucial regulatory tests. Also, for tooth repair applications, it may be used at lower doses than those used in Alzheimer’s trials. Even better, the drug may be delivered by means of a collage sponge that is already commercially available. Together, the tested drug and the commercially available sponge could expedite the introduction of a new dental treatment that encourages natural tooth repair. “Here we describe a novel, biological approach to dentine restoration that stimulates the natural formation of reparative dentine via the mobilisation of resident stem cells in the tooth pulp,” wrote the authors of article in Scientific Reports. “Biodegradable, clinically-approved collagen sponges are used to deliver low doses of small molecule glycogen synthase kinase (GSK-3) antagonists that promote the natural processes of reparative dentine formation to completely restore dentine. Since the carrier sponge is degraded over time, the authors added, dentine replaces the degraded sponge leading to a complete, effective natural repair. This approach differs from the conventional method, the filling of open spaces with mineral aggregates, which fail to degrade. With ordinary fillings, normal mineral volume is never completely restored. In their study, the King’s scientists emphasized that they set out to stimulate the activation of Wnt/β-cat signaling, an immediate early response to tissue damage that appears to be essential for stimulating the cellular-based repair in all tissues. A downstream target of this signaling pathway is Axin 2, a negative regulator. Ultimately, the scientists developed a method that uses an already clinically approved biomaterial (the collagen sponge Kolspon) as a delivery vehicle for small-molecule GSK-3 inhibitors that act as Wnt agonists. The scientists tested three GSK-3 inhibitors— BIO (2′Z,3′E)-6-bromoindirubin-3′-oxime), CHIR99021(6-[[2-[[4-(2,4-dichlorophenyl)-5-(5-methyl-1H-imidazol-2-yl)-2 pyrimidinyl]amino]ethyl]amino]-3-pyridinecarbonitrile), and tideglusib (4-benzyl-2-(naphthalen-1-yl)-[1,2,4]thiadiazolidine-3,5-dione). All three were found to stimulate tertiary dentine following experimentally induced pulp exposure.